This is a product for defense customers, such as military vehicle manufacturers, ammunition and weapons producers, providers of blast protection and fortification, as well as defense agencies. "We provide an efficient virtual test lab for defense applications to complement your physical tests." Impetus DEFENSE expands the popular Impetus BASIC package with a computationally efficient discrete particle module. 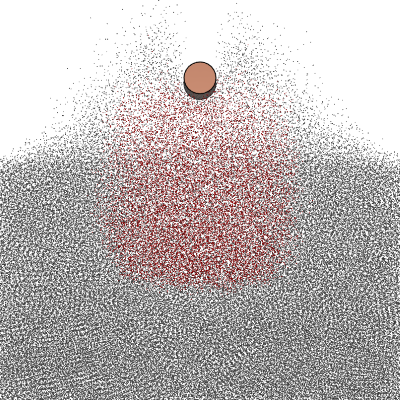 The discrete particles are used to represent the physics of high explosives, air, soil, and their interaction. There is a two-way coupling between the discrete particles and the structural response, represented by finite elements. The module makes it possible to perform very realistic simulations of complete vehicles and/or armor systems being subjected to blast loading from IEDs buried in soil. It can also be used for terminal ballistic purposes, such as warhead fragmentation and the interaction with targets. The discrete particle module utilizes GPU acceleration which gives a total performance boost of up to 20X. This module is used to describe the physical behavior of soil, air and high explosives by discrete particles. The module adds to and communicates with the FE module in order to fully couple the structural response with the behavior of the material represented by particles. Several explosive materials, as well as wet and dry soil conditions, have been predefined. The high explosives and soil models are easy to customize. It is possible to configure user-defined high explosives and soil to suit all kinds of applications.